Ask your loved one if help is needed rather than simply taking over. It’s normal to want to jump in to help immediately when you see a loved one struggling with a task, but before doing so, ask the person if help is needed. It might be that your loved one just needs a bit more time to accomplish the task independently. Research different types of assistive devices that can be helpful, such as medication reminder devices, products to assist with a particular condition, and gadgets to make everyday activities such as opening a jar or holding a utensil easier. Let your loved one do some activities that you know he is capable of, like washing up or walking a few steps without assistance. It is important to remember that even if you have to help a little or provide supervision for safety, small activities like these still provide a sense of achievement. 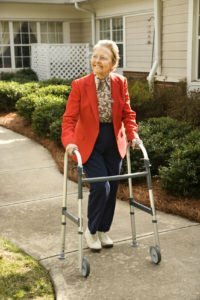 Provide assistance with home safety adaptations such as grab bars in the bathroom, hand rails along stairways, adequate lighting, home accessibility and furniture placement. For more help with assisting your senior loved one in maintaining independence, improve self-image, and enhance overall quality of life, call on Hired Hands Homecare for Marin CA home care. We work together with families to ensure seniors remain as independent as possible, and we would love to talk with you about how we can help your senior loved one as well. Serving Marin County, we’re just a phone call away. Call us at 415-884-4343 or contact us online to find out how we can help promote a safe, independent lifestyle for your senior loved one.